An ice dam is a buildup of ice at the lower edge of your roof (eaves) which prevents water from flowing off of the roof allowing it to eventually penetrate the roofing material. Roof shingles are designed to shed flowing water not to block standing water. As a home inspector and general contractor I have seen many homes with ice damming but it is most common in older homes. 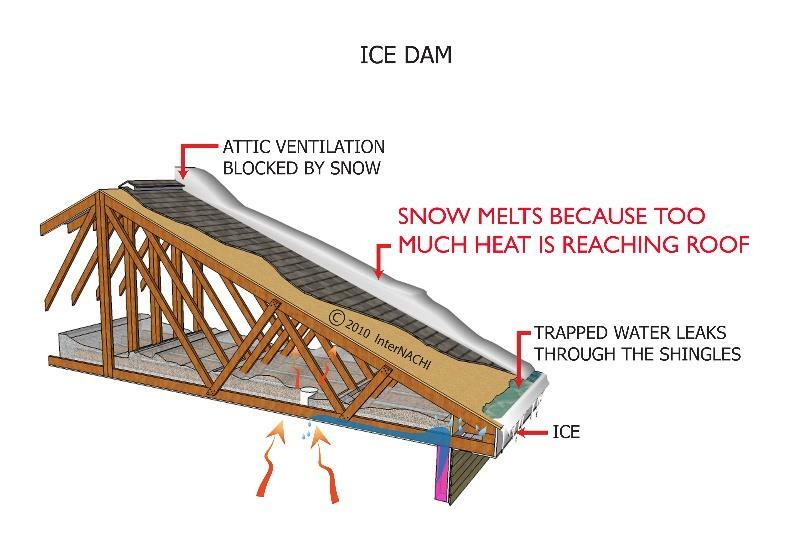 Ice dams are caused when the roof is warm enough to melt snow, then the water flows down to the eaves which are cooler causing it to refreeze, creating a dam that can cause water to pool and damage to occur. Damage can include water stained ceilings, walls and wet insulation which compounds the problem. It can eventually lead to compromised structural components or mold if left uncorrected. Stop warm air infiltration into your attic. An airtight ceiling is your best defense. Modern air sealing techniques as dictated by the new energy code are not feasible for existing construction unless you are doing a major remodel. But there are things you can do. A common issue I see are attic access panels that are not insulted and sealed. The edge of an access panel should have a gasket or weather stripping. The top of panel should have 20 inches of fiber glass bat insulation. Pull down attic stairways should have a cover of rigid foam board 8 inches thick. Attics should only be accessed when service work is needed. A well-sealed attic is not conducive for use as a storage area. Whole house fans must have a method to seal and insulate them during the heating season. I was once in an attic investigating a large ice dam and found the whole house fan had been covered with only a blanket and even though the louvers were closed I could see the home owner in the hallway below. This fan was directly in line with the ice dam. It was like having a 3 foot by 3 foot window open to the winter cold. I have not seen an easy or convenient way to insulate these, so therefore I don’t recommend having a whole house fan but have clients who love them and feel they are worth the hassle. Pathways for plumbing and electrical should be caulked or sealed with a can of spray foam. If you have an unfinished basement ceiling start there. Seal wherever you see wires or pipes going up through the basement ceiling or top plates of walls. Do the same in the attic. 1. Attics are difficult places to work so if you are not certain of your abilities then hire a professional as this may prevent you from damaging your home or yourself. 2. Chimney flues, water heater vents, etc. have specifics requirements on what can be in contact with them and should only be dealt with by a professional. A poorly insulated attic will contribute to ice dams. Today’s energy codes call for an R- factor of 49-60 for the attic floor. You can measure the depth of you insulation to see how you stack up. Fiberglass or cellulose insulation has an R-factor of 2-3 per inch. Even if you can only get R-38 into your attic it will help immensely if your attic is under insulated. Loose fill or blow in insulation is preferred over batts because it can fill in around the nooks and crannies that you just can’t cover with batts. Add extra insulation on recessed lights but only after confirming that are IC rated meaning they can be in contact with insulation. This rating will be stated on the light. Attic ventilation is also important. Ventilation is most commonly achieved by using both soffit vents (located on the undersides of the eaves) and roof top or ridge vents. Cool dry air is drawn in the soffits and exits through the ridge vents. Soffit vents are often clogged with dirt and need to be cleaned occasionally. If you don’t have overhangs then you probably have gable vents located at each end of your house. These should be cleaned also. Proper ventilation accomplishes two goals. Helps keep the roof cool and more importantly keeps the insulation from getting damp. Insulation loses its effectiveness when damp. Bath and kitchen duct work must exhaust through the roof and not into the attic. These ducts should also be insulated. HVAC equipment and duct work is not typically seen in attics in Minnesota but need to be insulated if present. Skylights also can contribute to the problem. 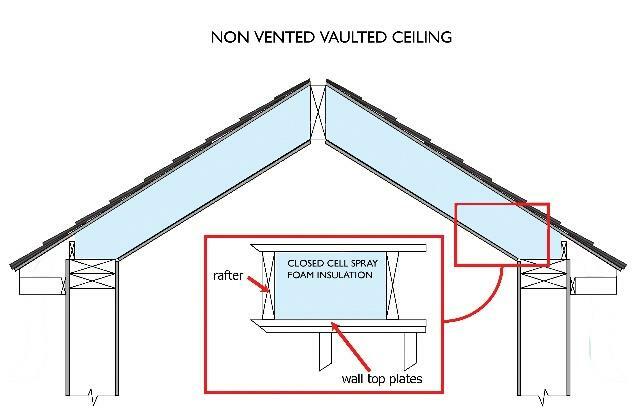 Vaulted ceilings are more prone to ice dams then regular attics. Do not use recessed lights in these ceilings. In new construction, modern techniques have addressed most issues associated with cathedral or vaulted ceilings. Thicker roof structure allows for more insulation while still leaving room for ventilation space above the insulation. Problems arise when an older home such as a 1 ½ story cape or bungalow, for example, has had the attic converted to living space. Typically a partial vaulted ceiling is created usually with knee walls. Unfortunately the rafter depth is often only 6 inches. This is not enough depth to properly insulate and maintain a ventilation space against roof sheathing. This can be addressed a couple of ways. First method, is to add ridged foam board underneath rafters before installing finish material. This increases R-value and provides a more air tight seal. If head room cannot be sacrificed a second method would be to create a non-vented ceiling. This is done with closed cell spray foam and is not a DIY project. Knee walls should be treated like regular attic space. Problems arise when a homeowner wants to use this area as storage space. The access doors often let warm air into this area. 6. Already have ice dams? Take pictures! If later on you hire a contractor to address the issue pictures may help locate problem areas. Heating cables have a very limited effect on ice dams. Although they can be helpful keeping gutters and downspouts open. Gutters that are clogged don’t cause ice dams but they can give them a head start by not allowing water to flow away as fast. Snow rakes can help on some houses but are limited to one story homes and care must be taken to not damage shingles. Also take care if there are overhead power lines present. The best way to have an ice dam removed is by hiring a company that uses steam to remove the ice. Using an axe, hammer, ice pick, power washers or even chainsaws likely will cause damage to your roof or personal injury to you. This entry was posted in Correcting Home Problems, Home Improvement, Home Maintenance and tagged Air Leaks, Attic Insulation, Attic Ventilation, Ice dams, water damage, Whole House Fans by Joe Maki. Bookmark the permalink.